The human body naturally produces enzymes on its own, however, as we age, the production of enzymes reduces dramatically. Those who are suffering from enzyme deficiency can notice an onset of many health problems including poor digestive health, bloating, joint pain, body-wide inflammation, slower healing, build up of toxins and accelerated effects of aging. Enzymes are vital to life as they are required for nearly 3000 chemical reactions throughout the body. 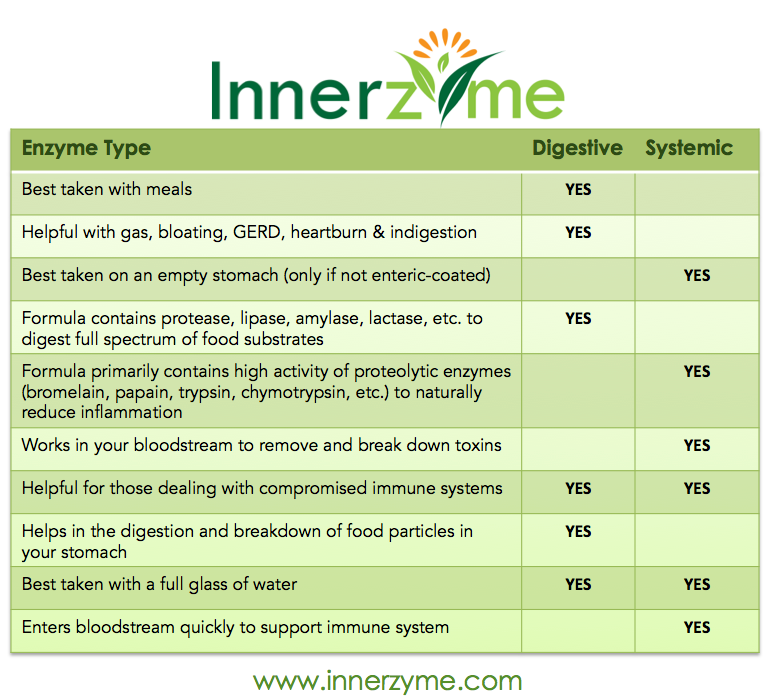 What is the difference between a digestive and systemic enzyme? Digestive enzymes are taken with meals and aid in the digestive process. A well-balanced digestive formula will contain protease, lipase, amylase and lactase to help digest a full spectrum of food substrates (fats, carbohydrates & protein). Digestive enzymes help improve nutrient absorption and aid in the natural relief of gas, bloating, GERD, heartburn and indigestion. Although enzymes are available in raw fruits and vegetables, most diets simply do not supply enough digestive enzymes for optimal health. Also, most food enzymes are destroyed by cooking, microwaving, canning, processing and pasteurizing. Systemic enzymes work “systemically” or throughout the entire body to optimize and maintain overall health. Unlike digestive enzymes that breakdown in the stomach and aid in digestion, systemic enzymes that are enteric-coated will breakdown in the duodenum (first part of the small intestine) and disperse throughout the body to help reduce inflammation, cleanse the blood, rid the body of toxins and excess fibrin while supporting healthy immune system functioning. Many people use systemic enzymes, like Innerzyme Pain & Inflammation Blend, as a natural alternative to NSAIDs (non-steroidal anti-inflammatory drugs). Daily supplementation with a high quality digestive and systemic enzyme supplement can help improve your overall health and naturally fight the effects of aging caused by enzyme deficiency.